When summer rolls around at my house, we use our BBQ at least a few nights a week. I love when I get to relax a bit and have my husband grill and I make the sides. The kids even get excited over anything cooked on the BBQ and willingly help set the table for me. BBQ’s here have become a family event even on those crazy weeknights, that you can just whip something up on the grill. There are so many things you can make on the BBQ from your jazzed up burgers, side dishes or even a few savory summery desserts. I have found 35 mouthwatering BBQ recipes for you to make on the grill this grilling season. Whether you are hosting a BBQ or just need BBQ recipes for your family there is something for everyone. Tell me, what is your all time favorite BBQ recipes? Grilled Watermelon? That sounds amazing. I totally need to try that one! Robin (Masshole Mommy) recently posted…Summer Staycation Ideas! Thanks so much for this! They all look so good! Oh my goodness. They are sound so amazing. Especially the grilled asparagus. Mistee Dawn recently posted…AirForce Blowguns Review! The grilled asparagus definitley does sound tasty!! I want to try that, too! All these recipes look yummy. I can’t wait to try some of these out. Thanks for sharing . Thanks for the roundup! I know what my summer eating schedule is now! My son love BBQ and can not get enough of it. I think we will start at the top of the list and work our way down. I love summer and all of the grilling recipes – my favourite has to be the grilled zucchini – just divine! This is such a great round up! Yes thats a great one too! You ain’t a kiddin’ when you say mouthwatering. There’s so MANY great choices listed!! Yum! Wow – delicious! BBQ is my fav! Thanks for the round-up! I can’t wait to start barbecuing. We just bought a grill. Mmmm, there is nothing like food cooked on a grill! I have just discovered a love of asparagus. I haven’t tried it on the grill yet, but plan to very soon! Great BBQ post! It is so good grilled Theresa! Its one of my families favorite side dish. I’m officially hungry now. so good. The Bacon Wrapped Hot Dogs sound deliciously interesting! I’m a big fan of BBQ Chicken, especially on the grill! With the 4th of July almost here and our grill ready I just may have hubby do some of these. Thanks for the ideas. Great round up of recipes. Barbecue and togetherness… great times for all. We love grilled pineapple. It is so yummy! thanks for this great round up – going to be trying some. Awesome round-up! 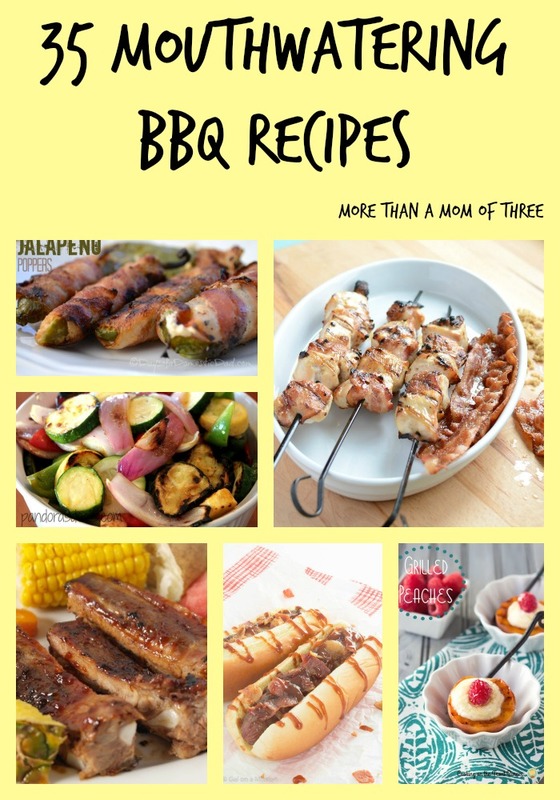 We have a BBQ party coming up soon so this collection of recipes is perfect! p.s. Dropping by from Wonderfully Creative Wednesday link party 🙂 ! This is a great list. Thanks for sharing it at The Weekend Social, I’m looking forward to seeing you again next Thursday at 9pm EST at http://www.thequestionablehomesteader.com for another installment of The Weekend Social. Thanks for sharing our Grilled Corn with Cilantro Lime Butter. I can’t wait to check out some more of these recipes. They all sound great!!! So much yes! I love grilled food and all of these recipes look amazing! Thanks for sharing your round-up with us at Merry Monday this week! These look fantastic! Thanks for sharing with the Delicious Dishes Recipe party this week!